Aphrodite Apartments are situated in the popular resort of Laganas on the south-east coast of the delightful Greek Island of Zante (Zakynthos). The family-run Aphrodite Apartments offer 40 attractive rooms and studios contained in several buildings set amongst colourful gardens and hosting a sparkling pool with sun terrace. An affordable B&B service is complemented by great snack bar facilities for light lunches and refreshments all day by the pool, an equipped in-room kitchenette, and guests can enjoy BBQ nights and big screen sports. The Aphrodite Apartments are all about enjoying friendly Greek hospitality in value for money accommodation on the lovely Greek Island of Zante. Getting to the hotel: Zante International Airport is 3km from the Aphrodite Apartments. Local tips: The cosmopolitan centre of Laganas is only 500m away with plenty of restaurants, tavernas and bars - the nearest only 50m; Zante town is 5km with a range of entertainment and shopping attractions. 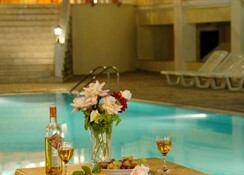 Food, drink and entertainment: Air-conditioned poolside snack-bar offers breakfast, salads, refreshments etc. all day, wide screen sports TV, and BBQ nights. Sport, games and activities: Swimming pool with sun terrace & gardens, free sun beds & parasols, poolside toilet facilities, pool tables; the 9km stretch of beach at Laganas is 1700m away. For the kids: children's pool section. Additional: Front Desk services, housekeeping, safe boxes, photo developing service, parking area, and nearest supermarket just 80m away. 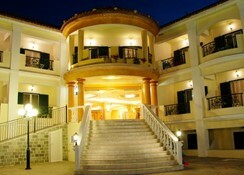 The Aphrodite Studios are located in the lively resort of Laganas on the popular Greek island of Zante. The beach is only 170 metres away from the studios. Laganas beach is one of the largest sandy beaches in Greece. There are plenty of beach activities to take part in such as paragliding, scuba diving, wind surfing and snorkelling. The centre of Laganas is nearby the studios, where visitors will find plenty of shops, restaurants, bars and clubs along the strip. There are plenty of English-styled pubs and bars there. The medical centre and supermarket are also close by. A famous attraction to visit whilst in Zante is the shipwreck Navarigo, one of the most photographed beaches in the world. Visitors can see this attraction while enjoying an island tour by boat. The complex has pool tables and offers a BBQ night once a week. The complex is perfect for those who want to relax in a peaceful location whilst having the choice to take in the cosmopolitan culture that has made Laganas a talked about destination. For those who enjoy soaking up the magnificent views can take part in the walking and cycling tours offered on the island. For those who are looking for a fun day out should visit the water slides, a fun way to spend time with family or friends. The Aphrodite Apartments features several blocks consisting of 40 Apartments situated around a large swimming-pool and set in beautiful landscaped gardens. All rooms have either double or twin beds suitable for 2-3 persons (an extra bed can be provided), kitchenette with cooking facilities and fridge, shower/WC and furnished balconies which over look the swimming-pool. 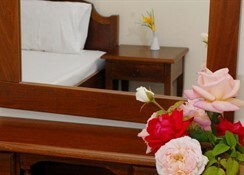 All rooms are air-conditioned (extra charge).